These 'zombies' feed on bad management and cost your business bigtime. The Walking Dead may have ended for the season. But that doesn't mean the zombies are gone. Related: Beware! 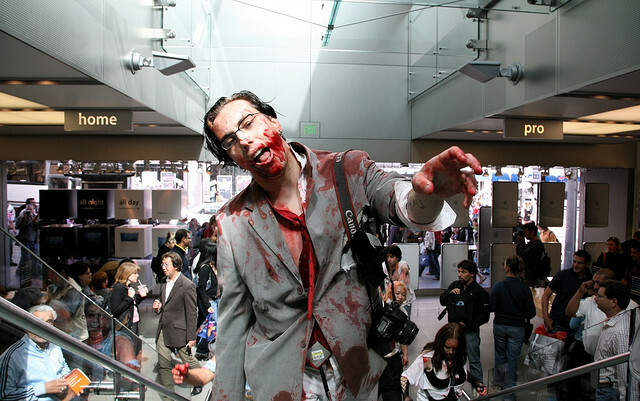 iIs a 9-to-5 schedule turning employees into zombies? In fact zombies may be a staple of a workplace near you, because of the widespread problem with the way most employers treat their employees. It's not that that those employers are mean or unethical, but they're still doing something wrong. Consider the recent poll that reported that 76 percent of employees say they are unhappy or disengaged at work. In other words, people genuinely just don't like their jobs. This is a problem for employers: The numbers are showing that workers are well on their way to becoming cash-collecting "zombies": They're being dumbed down by management and told they can't color outside the lines. They're being made to believe that whatever management says is right. In response, we can only hope that new technologies and applications improve the numbers around employee engagement, as managers (hopefully) make smarter, data-driven decsions. Related: Ignoring employee morale will cost you. Here's the solution. Indeed, forward-thinking HR managers are already shifting their efforts; and HR analytics and big data are being analyzed, with the hopes of bettering the office atmosphere. The true leaders in management realize that the workplace is an ever-evolving thing, and take the time to make sure they stay ahead of the curb. This entails coming up with great employee-engagement solutions. However, the poor leaders out there are still creating disengaged workplaces: They're focusing on themselves rather than the betterment of their people and their companies. And many of the disengagement issues stem from archaic practices still being used: managers thinking they know what's best, and employees never having a voice or being forced to perform repetitive tasks. The Tayloristic approach to the workplace has caused the problem, yet most companies aren't aware of the science involved. So, do you fear your own Working Dead? Does your office work entail repetitive motions which require no thought? Do you have employees forced to follow people who think they have the biggest "brain" -- but don't? And what is your role in causing all this? Check out the following infographic for help identifying zombies and the damage they do.